Robe à la Polonaise de Taffetas 1775. Home » Robe à la Polonaise de Taffetas 1775. Young Lady in a taffeta dress, 1775. Jeune Dame, vetu d’une Robe à la Polonaise de Taffetas uni, garni en Linon, Bonet à la Glaneuse. Young Lady in a taffeta dress in the Polish style. Decorated with fine linen lace. Hairstyle by type of farming Gleaners. The oldest Polish style (about 1772-1780) is a modification of the robe à l’Anglaise, which differs from that, is that the dress skirt is gathered up at the back with the help of two cords or ribbons. In most cases the tapes were attached to the inside of the waist line and pulled through the inside of the skirt installed loops, so that the gathering could be strengthened or weakened by shorten or lengthen the straps. There are next copies, in which the cords of the one end of the outside, are attached to the other inside of the waist line. In this case, no height adjustment is possible. The gathers at two sites results in a visual tripartite division of the skirt, which will be responsible for the naming, since 1772, when the polonaise became fashionable, the partitions of Poland began. The rear bagging skirt accented by a cul de Paris called padding part. The Glaneuse (Bonet à la Glaneuse, Les Glaneuses) referenced, to the gleaning (Pickings). It was a common method of harvesting the lower social strata of a village. Which occur after the section and removal of the grain on the field remaining ears of corn were searched and collected at harvest time. 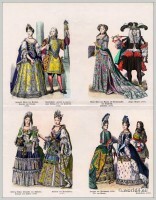 Source: 1er Cahier de la Collection d’habillements modernes et galants avec les habillements des princes et seigneurs. Paris 1780. Dessiné par Claude-Louis Desrais; Gravé par Martial Deny; Carl de Vinck. Éditeur et marchand, André Basset. 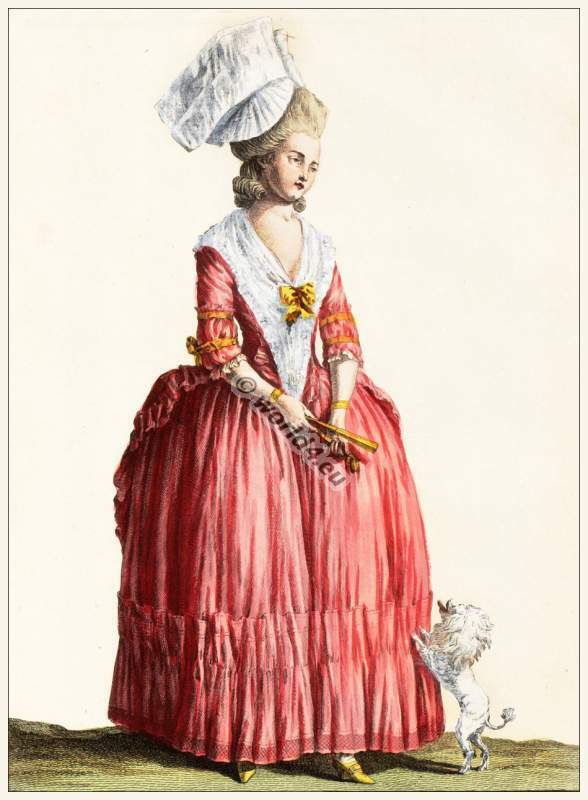 Published in the Galerie des modes et costumes français, by Jacques Esnault and Michel Rapilly. 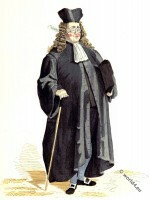 Courtier in Rococo clothing in the time of Louis XV. Robe à la Diane. 18ème siècle la mode rococo. 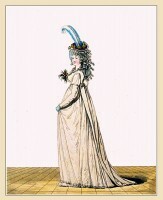 Regency robe and petticoat of striped muslin 1794. This entry was posted in 1775, 18th Century, Cabinet des Modes, France, Rococo and tagged Bonnet, Collection d'habillements modernes, Rococo fashion on 9/20/13 by world4.